As we sat around the campfire at Lake San Antonio, John one my friends was reflecting on some of the crazy things he did as a kid. John had one story in particular that cracked me up but also stuck with me. It happened when he was a young teen. John’s folks as good parents told John and his brother they could go play after the front yard leaves were raked up. Sounds reasonable, but it was Fall and the descending leaves dropped with the rhythm of a wind chime against a gentle breeze. No matter how hard or fast they worked, John and his brother could not keep up with the steady stream of leaves. When John’s parents made a trip to town, John and his brother came up with a brilliant plan. They climbed and crawled across every branch until every leaf attached to the tree was removed. Needless to say the job was completed when their parents returned, but they also were in trouble. In their effort to reduce their suffering they placed the tree at risk for dying and diminished the beauty of their home. You see, leaves provide the area for the process called photosynthesis that we learned about in high school. In simpleton terms, the leaves are energized by sunlight and use the carbon dioxide and water to produce a bi-product called oxygen. The process of photosynthesis on a large scale sustains life on earth. What made me think of this story and chuckle? I would love to pull off all my struggles and just go out and play. Oh to be finally done with it! However, I would miss an important life sustaining process. Photosynthesis not only produces oxygen for others, but also helps feed the tree itself with the sugary sap it makes. God is the One who is in control of how many leaves fall at a given time and when it is finally Springtime and new leaves bud. Well, as you may have read earlier in my past blogs that at Christmas our family and our friends always play the Holy Spirit game. One pulls out a “word” from a mixed bag of promises. This word is for the next year. Wouldn’t you know it? I pulled out the word “perseverance.” Here’s the definition: To persist in anything undertaken and to maintain a purpose in spite of difficulty, obstacles, or discouragement; continue steadfastly. I am smart enough to know that if He’s given me the word, He’s also given me the strength. There are seriously times when I wonder how many more leaves could possibly fall and when will I ever be able to just go out and play? I think I have learned a small secret. Maybe instead of waiting to play after the leaves are done dropping, we should play WHILE the leaves are falling. There is nothing like jumping in a pile of crunchy leaves or throwing them in air and yelling. I am pleasantly surprised at how wonderful falling leaves are. I have laughed till I cried these past few weeks at the stupidest things and craziest of places. Am I comfortable? No. Am I frustrated at limits? Yes. But I have learned to play! I’m kind of slow, but I am getting what the verse “The joy of the Lord has become my strength” means. It is not just talking about joy when everything is honky dory. 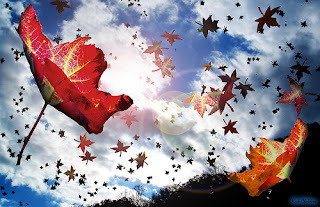 It’s finding that joy in the falling leaves – It is so empowering!! !